The SkinBase microdermabrasion Facial™ is a safe, controlled treatment that intensely exfoliates and resurfaces the skin. It's the leading skincare treatment in the UK & Ireland for complete skin rejuvenation, available at over 1,600 leading salons. A fine jet of abrasive crystals gently removes dead skin cells layer by layer and a vacuum action lifts away the debris, stimulating the blood flow and encouraging collagen and elastin formation that results in firmer, revitalised and youthful looking skin. Wrinkles disappear, acne scarring is reduced and dull and tired skin is completely banished - sometimes after just one treatment. 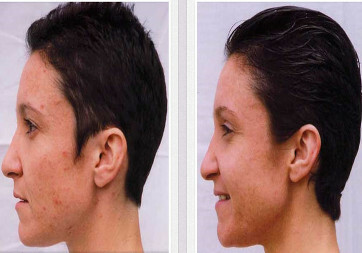 Effects are usually seen after the first treatment, with ongoing improvements seen week after week during a course. Your SkinBase therapist will perform an initial consultation and recommend a course length to you. Usually, this will consist of 6 to 8 treatments, 7 to 10 days apart. Skin problems such as acne or acne scarring, or deeper forehead wrinkles may require up to 20 weeks to achieve full improvements. After a course is completed, a single monthly treatment will maintain your skin's improvements. Our new Beauty Lab treatment effectively smooths, exfoliates, softens and clears the skin while stimulating healthy cell growth, with a long-term benefit of controlling sebum. The treatment has an active exfoliant that speeds up cell renewal and reveals smoother, brighter, more supple skin with less pigmentation and fewer irregularities. Helps relieve blockages and congestion for easy extraction. Want to find out more? Call MITYME Beauty Therapy and speak to our beauty consultants today. We'll arrange an appointment with you to discuss your needs and develop a personalised course of treatments and services. We've also got a great range of branded products available for you to take home with you, allowing you to extend the effects of your treatments and maintain your new style.